This product that I want to share today has been on the market for a few months now, but as I just found at at my most recent Weight Watchers meeting, surprisingly, not everyone knows about it!! Remember when Wonder Bread used to make those DELICIOUS 1 Point hot dog buns? Me too. And I was so beyond sad when they discontinued them. 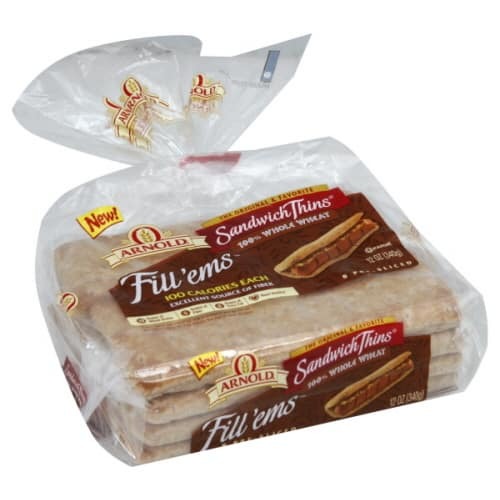 For many a month I mourned their loss, and then was beyond overjoyed when I saw that Orowheat/Arnold’s came out with a new product called “Fill ’ems”. Finally, I could have a low Points hot dog again – life is good. Keep reading too get the low down on this Fabulous Food Find! 100 calories each. Excellent source of fiber. 9 grams of whole grains. 5 grams of fiber. 0 grams of trans fat. Heart healthy (diets low in saturated fat and cholesterol and as low as possible in trans fat may reduce the risk of heart disease). Orowheat Fill’ems, you can no wrong. They are a great 1 Point Sandwich Roll or hot dog bun and work so will with a variety of Weight Watchers Sandwich Recipes. Why Orowheat has NO info about the Fill’ems on their website is beyond me, but I have seen them at a variety of major grocery stores. Granted, back on the old WW Points System, these rolls were just 1 Point each, but now they are 3 PointsPlus each. If you are looking for a good low calorie sandwich roll, you must check these out! Oh and I forgot to say…they are only 80 calories/bun! Thanks for the hotdog bun reccomendation. I went to Publix to find them yesterday and they only had the hamburger buns. I did not get discouraged. I kept hunting and I actually found something lower cal than the ones you had suggested. :-) Merita makes Lite Wheat Hot Dog Buns. I have not tried them yet but i'm sure they are tasty and look more like traditional buns. I found these today @ my local Sam's Club… I was very excited!!!!! Just found this site, where can I purchase the hot dog buns or for that fact a wienner that is one Point.